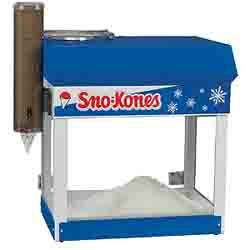 This high production snow cone machine has a momentary safety switch, hinged doors and lighted cabinet. It also features a removable inner ice pan for quick cleaning, and easy access for blade changing. Accessories included are: Sno-Kone dipper, 6oz cup dispenser, ice scoop and drain pan. This item is oversized. 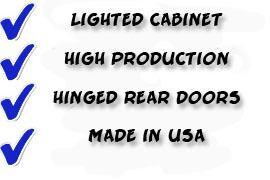 Must ship by truck. Call for best ship rate.